Red Skin Syndrome and Manual Lymphatic Drainage. Topical Steroid Withdrawal also know as Red Skin Syndrome or TSW. It’s when a person stops taking Steroid cream that suppress the immune system to control atopic dermatitis, the Steroid cream sometimes in cases has been applied for 10-15 years or more. Whilst chatting with a client today about his sessions of manual lymphatic drainage to help with his anniversary flair, we realized whilst looking through photos that it’s only been one month since he started Manual Lymphatic Drainage Therapy. The first photo is of his chest and neck one month ago. This was at his worst, red, hot skin and extremely painful distendedlymph nodes. The next photo is one month later and 5 sessions. A total difference, it’s amazing the skin soft and no heat radiating. He has only had a small amount of flairs so far but is feeling and seeing the dramatic change. Sleep has improved and adding breathing techniques has helped with stress. Time goes so quick that we both had thought this was over a three month period, totally surprised when we working it out it’s only one month. The power of manual lymphatic drainage, if your struggling with eczema flairs or TSW find out how Manual Lymphatic Drainage May be able to help with skincare and reducing swelling and itching, especially if you are starting to have wounds due to excessive inflammation. Contact The Movement Clinic via email or phone, Dr Vodder trained Lymphoedema therapists are located world wide, for more information on locating a therapist go to the Dr Vodder International Website, find a therapist page, follow the prompts. 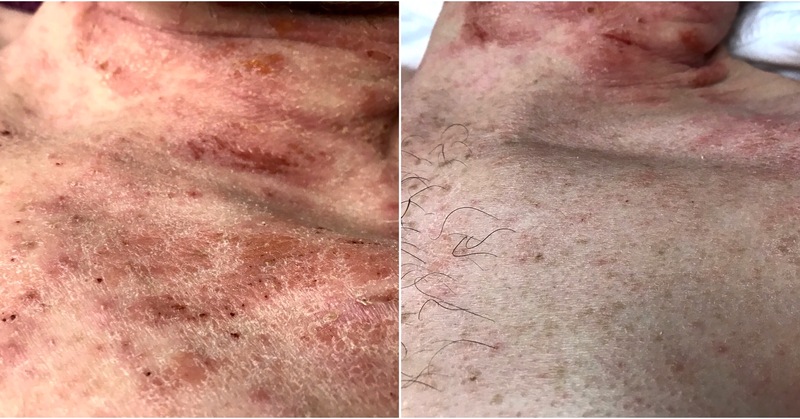 the below picture are before and after MLD for TSW, Red Skin Syndrome, Topical Steroid Withdrawal. One month.